On Tuesday, we found out the players who will be participating in the MLB All-Star game. Now, we officially know the sluggers who will be blasting long balls on Monday night at Petco Park. Mark Trumbo, Robinson Cano, Adam Duvall and Todd Frazier of the American League will be squaring off against Corey Seager, Giancarlo Stanton, Wil Myers and Carlos Gonzalez of the National League. The bracket-style format of the derby will now see Seager going up against Trumbo, Stanton taking on Cano, Myers facing Duvall and Gonzalez trying his luck versus Frazier. With the players now set, I figured I’d give my take on how I feel the derby will go. Although Seager is well on his way to winning the Rookie of the Year award for the National League, I don’t see him taking out Trumbo. Leading the league in homers, Trumbo simply has too much pop. Likewise, I can’t see Cano posting better numbers than Stanton. While Stanton has struggled at times this year, he seems to be locked in as of late and will likely carry that into the derby. The third matchup of Myers vs. Duvall is a very intriguing one, as well as a difficult one to predict. Even so, I’m going with Myers to move on, as he’ll have the backing of the home crowd. Finally, I feel that Frazier will be able to barely hold off Gonzalez to find himself moving on to the next round. If things go as I see them playing out, this round will see Trumbo going up against Stanton and Frazier taking on Myers. At this point, anything can truly happen, but I feel like Trumbo will find a way to beat out Stanton and move on to the final round. Furthermore, I see Myers surprising the baseball world and knocking off Frazier, with Myers having more power than a lot of people realize. Even so, any of these four players pose an very equal matchup against one another. A final round of the 2016 Home Run Derby with Mark Trumbo squaring off against Wil Myers isn’t exactly what many people are likely predicting around baseball, but it’s what I’m going with. Admittedly, these type of predictions rarely pan out, but it’s how I see things going. As such, with Trumbo and Myers going one on one in the last round, I inevitably see Trumbo beating out Myers. Trumbo simply has too much power to be denied the title this year. But that’s just how I see things panning out. Who do you think will win the 2016 Home Run Derby? Cast your vote below. It’s been just over a week since Opening Day launched the 2014 Major League Baseball season back on March 31st, and there have already been a lot of ups and downs for teams all around baseball, some of which were anticipated, but some that have come as a shock to many. Though we’re less than ten games into the long 162-game season, and many things can and will happen over the next several months, it’s interesting to take a look at how teams are beginning their season. The most surprising good starts to the year, in my opinion, have to be the Mariners, Brewers, Marlins, and Rockies, as each have gotten off to an unpredicted great start. While the Mariners picked up Robinson Cano this offseason, and made a couple of other great additions to their team as well, I’m not sure anyone predicted them to pitch and produce runs the way they’ve been able to do thus far. Everyone up and down their lineup is clicking for the most part, and their pitching has been really good. It should be interesting to see if they can keep up their 4-2 start. 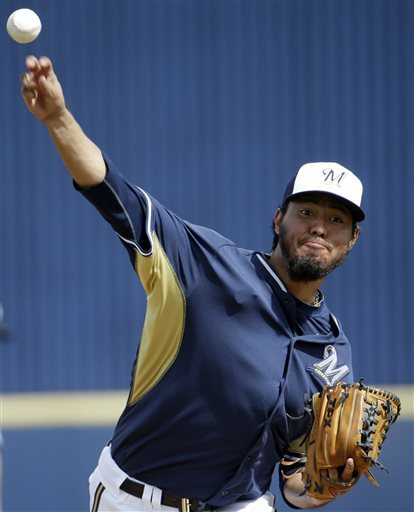 The Brewers don’t really have all that much above average talent past Ryan Braun and Yovani Gallardo, who can be hit and miss, but they’ve been able to put together a great start to the season. Going 4-2 so far this year, the Brewers, while still not predicted to do much, have shown that they have the potential to cause some problems with the rest of the teams in the National League Central division. Down in Miami, it takes a lot to get fans excited about the Marlins, ranking year after year towards the bottom in overall attendance, however, the start to the season the Marlins have produced is more than anyone could’ve asked for. Jose Fernandez has been fantastic in his two starts, and Giancarlo Stanton seems to have found his groove earlier than usual. Looking to build on their 5-2 start, the Marlins are worth watching. One of the great things about baseball is that you never know what may happen, and that holds true with the Rockies, who have gotten off to a .500 start of 4-4 to begin the season. Though they’re still expected to finish near the bottom of the division, with Carlos Gonzalez clicking as usual and Troy Tulowitzki finally healthy, in addition to a good start for their pitchers, they could surprise a lot of people. But those are just the surprising good starts to the year. On the other side of the spectrum, the most surprising bad starts to the year, in my opinion, are the Rangers, Diamondbacks, Reds and Orioles, who haven’t been able to put much together yet. The worst start to the 2014 season in all of baseball goes to Diamondbacks, who currently stand at 2-7. That comes as a big surprise, as they made several good moves this offseason, including acquiring power bat Mark Trumbo, who is currently one of the only bright spots on the team, besides Paul Goldschmidt, who is always consistent. The D-backs certainly need to turn things around, but they have plenty of time to do so. Cincinnati is one of those teams that can be good or bad, however, I thought they’d begin the year better than they have. With a 2-5 record, they sit at the bottom of their division, and with several players struggling (mainly Billy Hamilton) or injured, it could be awhile before they begin to rebound. Though, they’re still too good of an overall team to keep doing this poorly as the season goes on, in my mind. Like the Reds, the Orioles can be good or bad depending on several factors, but what it really comes down to is their pitching. Their offense is one of the best in baseball, with strong points up and down the lineup, but they need their newly added starting pitcher Ubaldo Jimenez to return to form for the Orioles to make a run in the division. Sitting at 2-5, it will be fun to watch the O’s in the difficult American League East. Picking up Prince Fielder this offseason, many people (myself included) predicted the Rangers to have a great year, possibly winning the division. However, due to a ton of pitching injuries, among other things, they haven’t been able to perform to their potential, currently sitting at the bottom of the division with a 3-4 record. But despite the poor start, the Rangers should be just fine. As stated, there is still a ton of season remaining where anything could happen. The teams that are off to a fantastic start could end up taking a tumble as the year goes on, while other teams that are struggling at the moment could very well take off on a major run. You never know what will happen throughout a given MLB season, and that’s what makes baseball so much fun. The 2013 Major League Baseball Gold Glove award winners were announced last night on ESPN2. There were multiple first-time winners, but everyone that won was extremely deserving — though I might not agree with them all. This marks the 56th annual Gold Glove Awards, which began back in 1957. Salvador Perez was the most deserving of this award, among the nominees. While they’re all great players, Perez had the overall better year; becoming the first Royals’ catcher to receive the award since 1989. On the National League side, Yadier Molina winning was an obvious choice. He picks up his sixth career Gold Glove. After winning his first career Cy Young award last season, R.A. Dickey picks up his first career Gold Glove. Though he had his share of rough games, he had an overall decent season. But I would’ve liked to have seen Mark Buehrle win. Of the nominees, it was a rather difficult choice for NL, but Adam Wainwright ended up getting the accolade. NL Nominees– Carlos Gonzalez, Starling Marte and Eric Young Jr.
Alex Gordon picks up his third straight Gold Glove, beating out Andy Dirks and Yoenis Cespedes in the AL. Carlos Gonzalez, like Gordon, received his third career Gold Glove award. Both were deserving, in my mind, and both have the potential to win several more before all is said and done. After winning a Gold Glove in 2012 — many feel Mike Trout got snubbed — Adam Jones picks up his third career award, as he had another really great year. Carlos Gomez picks up his first career Gold Glove award, for the National League, having a deserving season for the Brewers. Both Shane Victorino and Gerardo Parra aren’t really acknowledged all that often for their gloves, however, both are really good right fielders for their respective teams. This is Victorino’s fourth Gold Glove, and Parra’s second. Both have the potential to win more down the road. Both the National League Gold Glove winner, Paul Goldschmidt, and American League Gold Glove winner, Eric Hosmer, had great seasons, earning them their first career Gold Gloves. Goldschmidt is a top candidate for National League Most Valuable Player — leading the NL in RBI’s and home runs — with Hosmer becoming the first Royals first baseman to win the award. For me, it came down to Dustin Pedroia and Robinson Cano, as both had great seasons and always seem to flash their gloves at some point during nearly every game. Pedroia ended up receiving the Gold Glove, which I’m completely fine with. Brandon Phillips winning his fourth career Gold Glove award is another one I’m fine with. Amazingly talented players on both the AL and NL sides. I was a bit surprised with J.J. Hardy winning, however, I don’t really have a problem with it. He was deserving of the award. Andrelton Simmons was also deserving of the award, as he made some amazing plays this past season and is worthy of his first Gold Glove. Simmons is a player to keep an eye on to win several more in his future. When you’re having to pick between Adrian Beltre, Evan Longoria and Manny Machado for the third base Gold Glove award you run into a problem: They’re all very deserving. But I have to agree with Manny Machado winning, as he had an incredible year, slightly greater than Longoria or Beltre. Nolan Arenado picks up his first career Gold Glove, for the NL, but it’s likely to be just one of many in his career. There were eight first-time Gold Glove winners. The Royals and Orioles had the most Gold Glove winners, with three apiece. This was the first year that sabermetrics were used as a voting component. Nolan Arenado is just the tenth rookie to ever win a Gold Glove. My original list included Chris Davis, Yoenis Cespedes and Prince Fielder, for the American League, with Evan Gattis, Bryce Harper and Giancarlo Stanton for the National League; at the time, Gattis was healthy. Cano ended up selecting Chris Daivs, Prince Field and Yoenis Cespedes, all of which I wanted to see. Wright got Bryce Harper, as well as a couple of players I didn’t pick, in Michael Cuddyer and Carlos Gonzalez, to participate, and while I would’ve like to have seen Stanton over Cuddyer, it is what it is. With the field for the home run derby nearly set, I wanted to take a second to give my thoughts on how I feel the derby will go. I feel like Michael Cuddyer won’t last very long in the derby, probably not making it past the first round. He’s having a great year, but just doesn’t have what it takes to excel, in my opinion. Carlos Gonzalez and David Wright should do a bit better than Cuddyer, however, I see Bryce Harper outdoing them both, for the National League team. I could easily see him making it to the final round. Harper has the power, as well as the endurance needed, to thrive in a home run derby. I have Robinson Cano doing the worst of the four players for the American League. But it all depends on which Cano shows up. He has the ability to do well, having won the derby in 2011, however, he can also flop under pressure, as he didn’t hit a single homer last year. I feel Yoenis Cespedes will do fairly well, but it will come down to Chris Davis and Prince Fielder, in my mind, with Fielder winning out in the end; though, not by much. I could easily see a final round of Bryce Harper and Prince Fielder. If indeed Harper and Fielder make it to the very end, I think Fielder has too much pop for even a young phenom like Harper to compete with. So, for the second straight year, that’s who I have winning–Prince Fielder. It shouldn’t come as a real surprise. Not many people have the home run hitting ability of Fielder. Prince Fielder is going for home run derby title number three, as well as a win in back-to-back years. Both are feats that only Ken Griffey Jr. has ever been able to accomplish, and if all goes as I see it playing out, Prince Fielder will soon join him.